Famous For: Adventure, Photography, Nature. Entry Fee: Visiting Kaudilaya and not trying out something adventurous is futile. So, you must be ready to spend to for the adventure sports or other activities because of which this place is famous. Visiting Time: Preferably from 8 a.m. to 6 p.m. daily. With this soothing natural environment on which the avid flora and fauna thrive, Rishikesh has become one of the premier tourist destinations in the world. While on one hand the pious beliefs of the religious abodes have purified the hearts and souls of the pilgrims since time immemorial, on the other hand the scenic beauty and the undulating terrain has put up a sporting challenge to the lovers of adventure who gather in Rishikesh to enjoy the beauty and magnificence of nature to its peak level. Thus, Kaudiyala is one such place that is situated very close to Rishikesh and is the prime spot for the adventure lovers. From river rafting to just a walk in the heart of nature, Kaudiyala has it all. Thus, people looking for adventure from all over the world flood to Kaudiyala to feel blood running through their veins. Wear comfortable shoes and appropriate clothes as the terrain is quite challenging. Also, carry extra clothes with you as you might get wet if you take part in river rafting and other such adventure sports. Book your adventure tour packages in advance so that you do not have to return dejected. You can take a guitar or any other such musical instrument if you are going to camp for the night. This way, you can enjoy a musical evening in the forest or by the river bank. Indulge in adventure sports like mountaineering, rock climbing, river rafting, camping and others. Do not forget to set up a bonfire if you are spending a night in this adventurous place. Carry your camera with yourself as you will be compelled to take multiple photographs of the scenic beauty around. Professional guides are available at this place and the fee is included in the package that you will book for yourself. The guide will help you to enjoy the wealth of this terrific place and take back wonderful memories with you when you return home. It is recommended that you visit the place from mid-February to May or from September to November for an exotic experience. However, you can visit Kaudiyala in the monsoon season too if you want to despite the high-risk factor if you want to be thrilled with the feeling of wild adventure. Kaudiyala is situated at a distance of 41 km from the main bus terminal of Rishikesh. The best way to reach this place would be to hire either a private or a shared cab for a comfortable journey. The hill station of Kaudiyala is popular all over the world because of the 6 different river rafting levels that it offers based on different difficulty levels of the gushing river there. The other adventure sports like mountaineering, rock climbing, river crossing and more have made this place a premium point of adventure. 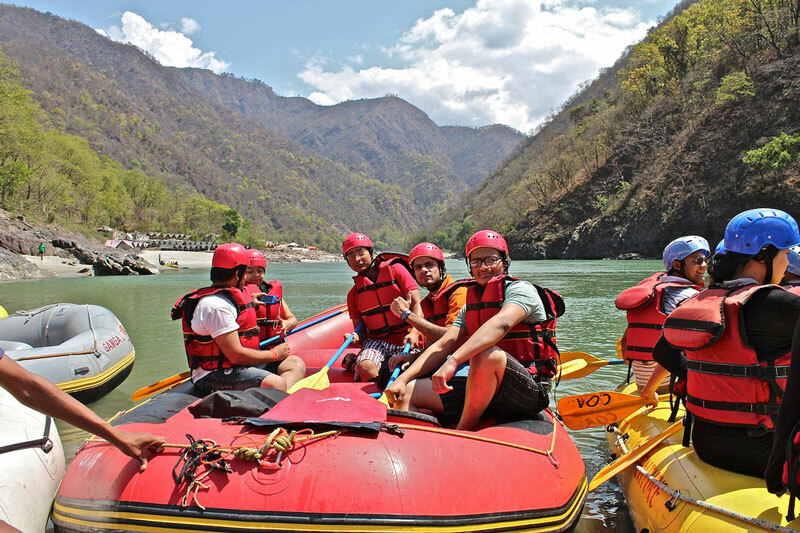 As it boasts of a delightful and an adventurous natural environment, Kaudiyala in Rishikesh has become the centre of adventure in Uttarakhand. Tourists from all over the world come here every year just to live through this deadly adventure that is unmatched to every other similar adventure ongoing in any other part of the world. Thus, to feel the life inside you with every breath you take, a trip to Kaudiyala is a must.